My first ever (ad)venture was selling books door-to-door. Back during my college years at LSU, I badly needed to make money during the summer breaks to pay for the mounting costs of a higher education (and too much partying). Little did I know that my summer job was to be the real education – my door-to-door sales experience is where I learned the difference between what we’re selling and why people really bother to buy something. The Thomas Nelson’s Varsity Internship Program, the summer franchisee program that I joined, provided student entrepreneurs with the world’s best selling book as our killer, ‘it sells itself’ product: none other than the Bible. At first, that proposition sounded really good news to me – go sell something that has a proven market. How hard could it be? Then came the bad news – my assigned territory was none other than Danville Virginia – the town in Virginia and possibly the US with the most churches per square mile and I could swear the most bibles per household – at least 10 per! (Ok, I may be exaggerating a bit). Danville Va. was smack in the heart of the Bible belt – Talk about selling ice to Eskimos! Me: “Miss Jones, let me ask you a question. Do you have a Bible”? M. Jones: “Yes, of course!”, clearly insulted. “Do you take me for a heathen? Actually, I have TEN Bibles”! Me: <completely stomped> “Ehrr…Do you know anyone who might need a Bible around here”? M. Jones: “Hello!!!??? Einstein!??? Or whoever you are. You’re in Danville Virginia – we’all have plenty of Bibles”! Then she felt a little sorry for me and said… “You seem like a nice enough young man.. Why don’t you try our neighbor that just moved up the street, Mohammed. I don’t think he has a Bible yet.” I did try, without much luck. I was dejected and ready to give up only after two sales calls. I wasn’t going to make a dime and readily blamed it on the program that had put me in a terrible sales territory with a product no one wanted. The next day I called HQ demanding to talk to the program’s head of sales to complain about my unfair treatment. He listened attentively to my ranting and then simply said “It’s not about what you’re selling, is about why people buy it – figure that out, and you’ll make plenty of sales”. Sitting on some park bench, eyeing my little book satchel with bad intent, snot running down my nose from crying like a little girl, I decided to give the manager’s advice a chance and tried to think of reasons why someone would buy a Bible in the first place. To read it? To attain salvation? To fall asleep? But why would they buy another Bible if they already had 10? Why, Why?? I wasn’t getting anywhere. Then I actually took the product out of the satchel and began to examine it carefully, as for the very first time. Next, I visited a nearby church (right across the street from my park bench… remember, there are more Churches than Starbucks in Danville). It was then I had an epiphany. People in Danville took their Bibles to Church. Some never really took it out to read it, but had it in plain sight. Others were making an attempt to read it, but were having a hard time as the place was poorly lit. Me: Knock, knock.. door opens: “Hi miss Jones (a different one)! My name is Ricardo.. bla, bla…then I got down to uncovering needs, not business as usual. Me: “Miss Jones, let me ask you a question. How many Bibles do you have”? M. Jones: “Hummh?.… about Eleven I believe”. Me: “Oh great!”, I said relieved. “You must have the record for the most Bibles on this street! Would you show me your favorite”? M. Jones would promptly do so, I’d examine it carefully then I’d congratulate her on her prized possession. … She would hold it up to her nose, entranced in a long whiff, as if experiencing a ‘new car smell’, flashbacks to when she first bought her current favorite Bible. She’d grab her glasses and begin leafing through the book, caressing the unspoiled pages, as if white sand was flowing through her fingers. “Now take off your glasses, and please read the passage again”. It was then she’d notice the huge, large font print that distinguished our Bible, her soon to be new Bible. The Varsity Program was right – The product did literally sell itself – the smell, the touch, the sight… and the less I talked, the better. We lie to ourselves thinking we’re selling something – people are buying something – they’re not slaves to our whims. A great number of Danville’s miss Joneses’ would go on to purchase my Bible for three or four fundamental reasons I eventually uncovered during my travails (traditionally, we call this market segmentation). Maybe the M. Joneses primarily purchased the book because they’d envision themselves taking it to Church to show it off to their friends – For them to envy (I mean appreciate) the shiny-new leather cover, still emanating its divine smell. Maybe the M. Joneses bought my Bibles for the huge-print that eased their tired eyes in the dim-lit Churches, or maybe they bought them to keep up with the other M. Joneses or maybe they bought them simply get rid of me – but they definitely didn’t buy them because they thought they needed more Bibles and were already shopping for one! Whatever the reasons, the M. Joneses didn’t (ever) divide themselves up into tidy little market segments that someone could have deciphered apriori – I had to design those ’emotional buying buttons’ myself as I learned from each live interaction (then learn to recognize the pattern of interest in each customer – cut my loses and move along if I couldn’t uncover signs in the first 5 minutes (this last point was difficult to learn and separated the worst from the best salespeople (who didn’t waste time selling to those who had no need)). Ten out of 10 M. Joneses in Danville Va. would have said they would NOT purchase a Bible if you simply asked them that question in a survey – Why would they if they had Bibles coming out of their ears? The M. Joneses bought a new Bible because I proposed it to them, and I proposed it to them in a different, value or emotional needs category that their current Bibles occupied. Their current Bible(s) were already hired to get the ‘job done’ – of simply having the convenience or empowerment to read the Bible or take one to Church anytime they felt like it. I proposed a Bible to occupy other emotional needs augured by the multi-sensory buying experience. The point is this – Whatever product you’re selling, you need to figure out the deep emotional reasons why someone would be interested in buying – it’s usually not what you might initially think. The good news is that any given product can actually be re-positioned (or pivoted, for those Lean Startup fans out there) among several dimensions of buying criteria. The dimension you pick is often driven by what other dimensions are already covered in the consumer’s mind (where the competition already exists). Try to uncover an untapped dimension – no product or service category is necessarily staid – It is only our imagination that holds us back from unstrapping unmet deep emotional reason for buying stuff. 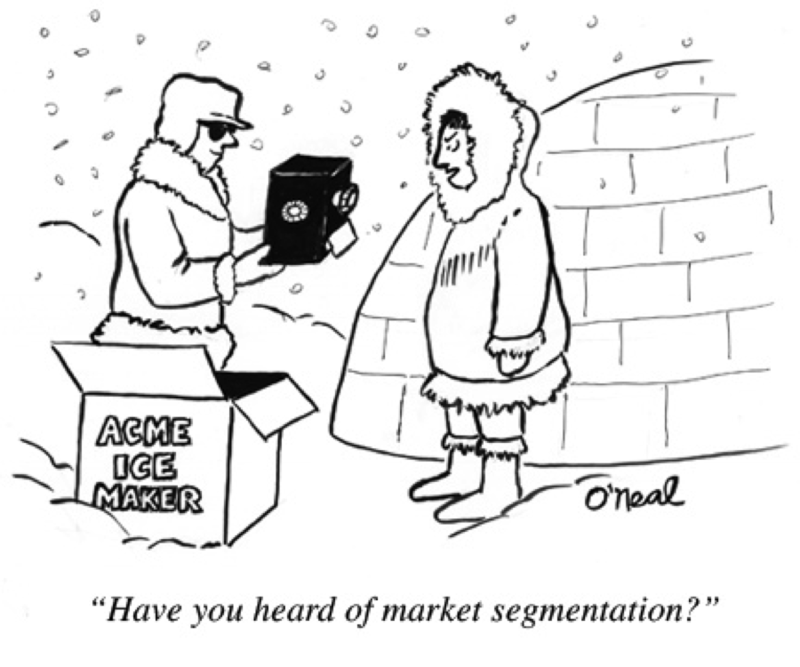 You can indeed ‘sell’ ice to Eskimos! In Part II of this blog, I will propose a unique categorization of human needs that products can fulfill – the deep reasons why people buy – and I’ll finish my Bible story. Great! It was nice reading! Join the Varsity Alumni Group on Facebook to find and connect with hundreds of bookmen. This is summer # 31 coming up for me!!! Feel free to refer qualified students to us. Let us know how we can promote you and your endeavors. Outstanding article. I generally skim through most blogs (speed reading) but this one, I had to stop and take it from the top. Awesome! All the best to you.